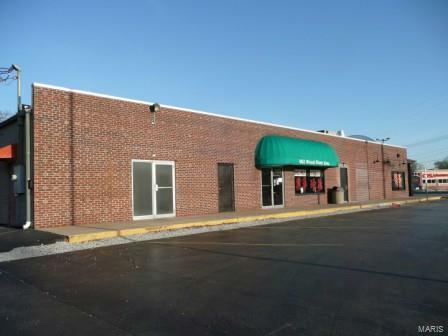 Excellent retail opportunity at the corner of Edwardsville Road and Wood River Avenue. Currently this space is being used as a Chinese restaurant and is part of a major retail strip center. Anchor tenants include Family Dollar and AB1 Phones and is located across the street from a CVS store (2012). This site is a few blocks from the East Alton-Wood River High school. Average traffic count is 14,900 VPD at the corner of Wood River Ave. and Edwardsville Road. There is a second retail space available that has up to 2,800 s.f. that the owner would consider subdividing the space. Zoning B-2 Community Business Dist. Association Greater Gateway Association Of Realtors Building Fuel Gas Commercial Lease Type Triple Net Commercial Property Type Retail Conditions Unknown Cross Street Address Edwardsville Road Current Use Restaurant Disclosures No Other Known Restr Electric Service Single Phase Gross Operating Income 0.00 Lease Terms Other/Call La Lease Type Other Net Income 0.00 Offering Lease Possession Negotiable Potential Use Food/Bev/RestaurantOffice/GeneralPersonal ServiceProfessional ServiceRetail OperationService Sale Includes Option To Lease Selling Terms Lease Sewer Public Special Description No Exemptions Special Listing Conditions None Square Footage Source Other Tax Year 2017 Taxes Paid 0 Total Expenses 0.00 Utilities Available CableElectricGasWaterSewer Water Public Year Built Description Unknown Zoning B-2 Community Business Dist.